Cid Style File: You Are Beautiful! The Mission of Operation Beautiful is to stop the "fat talk." Many women have so much self negative talk & thoughts about them selves that it can turn toxic and hurtful emotionally & mentally. The object of Operation Beautiful is make every woman realize she is BEAUTIFUL, no matter what size, color. shape. race or age she may be. 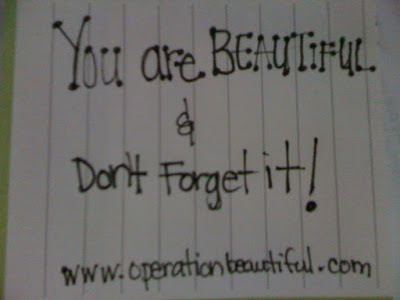 Check out Operation Beautiful and see for yourself that you are Beautiful no matter what any one has ever said. I love the idea and I hope you every woman, helps spread the message. Oh wow. I'm going to check this out as soon as I'm done with this comment. Thanks for the info. P.S. I also can't wait to get V Magazine. Its out January 16th! I actually left a note at the gym today and it felt good. After my workout I check to see if it was still there, and it was. Hope it made someone smile and feel good! Forever 21, Mia Tyler & Me!